Hey Giggle fans, guess who's back in town for Christmas? That's right, Jimmy Giggle and Hoot from the much loved ABC4Kids preschool program. 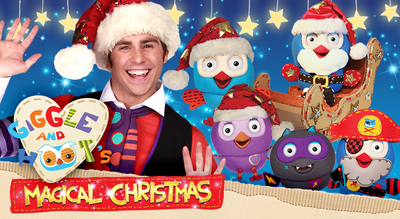 The famous daytime TV duo will appear live in stage, in Giggle & Hoot’s Magical Christmas. Get your children into the Christmas spirit and enjoy on-stage festive antics in the land of Giggle and Hoot where it is Christmas time and everybody is getting ready for the arrival of Hootoclaws. Ahead of the special Christmas Night Watch, trees are being decorated and gifts wrapped, but something strange is afoot when the dark night sky does not Twinklify and the stars suddenly disappear! Gather your little owl pals and help Jimmy Giggle & Hoot brighten the night sky again and save Christmas. Giggle and Hoot’s Magical Christmas stars Hoot, Hootabelle, Gigglefangs, Pirate Hootbeard, Hootoclaws and his dancing Elves and not forgetting, the one and only Jimmy Giggle!